The Next Generation CSR/Sustainability Jobs and Competency Development survey was conducted in partnership with Strandberg Consulting and The Conference Board of Canada’s Corporate Responsibility and Sustainability Institute, building off their report on Next Generation CSR / Sustainability Jobs published in 2017. The results were generated during the month of May, 2018 with 156 CSR/Sustainability Professionals participating; 31% which held the position of Senior Manager, Director, VP or Chief Sustainability Officer. The respondents, from a variety of sectors, identified broad pay ranges, educational backgrounds and job classifications. CSR/Sustainability professionals said their job pay ranged from $ 30K to $250K per annum. Twenty-five percent (25%) said they made $ 51 to 90K, while another 24% said they made $ 91 to 120K. Nearly 52% of those surveyed said they had a post graduate Certificate, Diploma or Degree (Masters or PhD). Job classifications ranged from Chief Sustainability Officer to Analyst and Educator. Managers and Directors were the most common job classifications of respondents at 20% and 19% respectively. Participants were also asked about their confidence in “First Generation” and “Next Generation” CSR/Sustainability competencies, which are explained in more detail below. Most respondents felt confident in their “First Generation” CSR/Sustainability job competencies identifying good to excellent strengths in problem solving, interpersonal skills, communications and environmental knowledge. They identified average to good strengths in computer, project management, and research skills. Respondents indicated lower confidence in their “Next Generation - Influencing Others" competencies. They indicated higher confidence in Partnering/Collaborating but lower confidence in strategic development, influencing departments and executives, change management, and enterprise wide implementation. Respondents indicated an even lower confidence in “Next Generation - CSR/Sustainability competencies". Many rating themselves fair to good on knowledge of company business and operations, sustainability/CSR trends and best practices; but poor to average on knowledge of their value chain and stakeholders, business planning/budget management/forecasting, catalyzing sustainability innovation, sustainability risk management and resilience planning, sustainability information systems, and sustainability investment/accounting/finance. The survey also asked CSR/Sustainability professionals about their transition to Next Generation CSR/Sustainability roles and integration of Human Resource practices to embed CSR/Sustainability into their organization. A final report of the survey results will be available in July 2018 at https://www.csr-stmikes.ca. The Certificate in CSR/Sustainability is taking applications for 2018/2019, with very few spaces in the program remaining. Participants this year come from Celestica, Canada Goose, Scotiabank, Frontiers North Adventures, City of Mississauga, Aurania Resources, HSBC Bank Canada, Financial Executives International, Institute of Management Technology, Kids Help Phone, Me to We, The Riverwood Conservancy, and many others. Ready to join this exciting community and be part of a global movement? Apply now through the Certificate in Corporate Social Responsibility/Sustainability Website. Check out the program schedule, past graduates and latest news. Module 1 will be held in Toronto, Canada, October 17-19, 2018. Module 2 and 3 will be held May, 2019 and November, 2019 respectively. The second intake Application Deadline is June 30th, 2018. 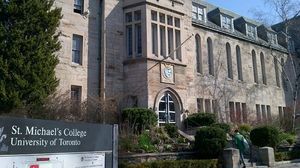 The University of St. Michael’s College (USMC), federated with the University of Toronto, offers a transformational CSR/Sustainability program that creates space for people of shared values to explore, interact, develop and grow. It empowers a community of changemakers to develop the skills and support needed to impact a thriving global future.